UP, DO I JUST COMPLAIN TO YOU? Microsoft Corporation develops, manufactures, licenses and supports a wide range of software products for various computing devices. Most known for its WINDOWS operating system on PC's, X-BOX, MSN search engine and MSN network. 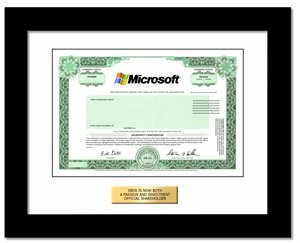 As of April 2012, Microsoft does not issue paper stock certificates and registers ownership electronically instead. The recipient still becomes a real shareholder of Microsoft Inc. with all associated rights.